Creating the perfect call to action can mean the difference between a business success and a complete flop. How do you make sure that the message you use will spring potential customers into action? Over 70 years ago during the Second World War , the Allied governments faced a similar problem. 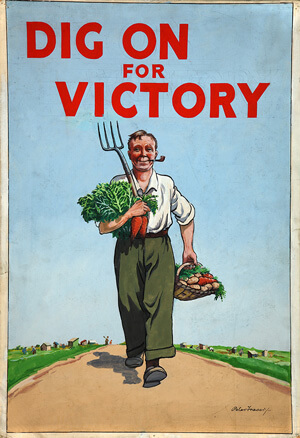 To ensure victory, they had to convince the citizens to unite and contribute to the war effort. And with so much on the line, each mistake could have tragic consequences. The Allies were successful and endured thanks to the efforts of soldiers and ordinary citizens. See what you can learn about creating a call to action from iconic WW2 posters that inspired thousands of men and women to help their country. Calls to action encourage users to take certain actions on your website or in your marketing emails. For example, if you want your users to make a purchase after reading your email, you need to place an appropriate call to action at the end of it. leaving a comment or sharing an article. And the list goes on and on. Any action on your website, in your emails or on your social media pages can be encouraged using a call to action. A call to action has the potential to make or break a newsletter campaign, a website or even a business. Marketers pour a lot of tears and sweat into them to make sure they do their job and convert visitors into buyers. In the same way, government officials of the WW2 era created movies, leaflets and posters that convinced citizens to take specific actions. In the US, a special organization called United States Office of War Information was tasked with encouraging citizens to conserve resources, keep information secret and join the armed forces. Here are some examples of powerful and iconic WW2 posters, along with the lessons you can learn from them to create irresistible calls to action for your business. The most important part of each call to action is its message. You need to use language that will convince your website visitors to spring into action. Using short, precise phrases with a strong verb will help you clearly state what the reader needs to do next. Posters urging citizens to “Buy war bonds”, “Dig on for victory” or simply to “Enlist” are a few examples of such powerful, actionable language. Creating a sense of urgency can help you convince the undecided visitors. For example, using words like “Now” or “Today” will help you encourage your website visitors to take an action without delay. Another powerful way of creating urgency is addressing the user directly with words like “You” or “Your”. 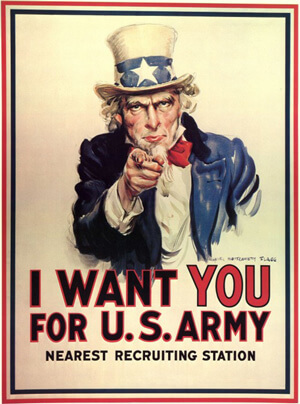 The iconic poster with Uncle Sam saying “I want YOU for the U.S. Army” is a perfect example of this method in action. Finally, you can also show the negative effects of inaction to support your call to action. Many WW2 posters created a sense of urgency by showing what could happen if the citizens didn’t act. The grim portrayal of the future displayed on those posters made the calls to action nearly a must. An alternative to creating urgency is showing what the visitor can get by performing a certain action. The reward will help you make any action sweeter, even if it requires some work. 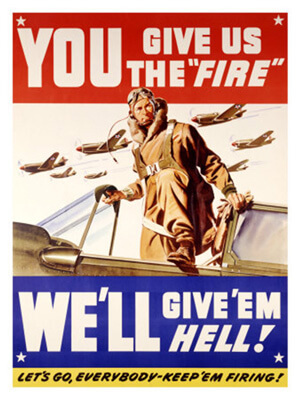 During WW2, many propaganda posters used the reward technique to encourage people to work harder to deliver more ordnance to the front. In return, they would get reassurance that it would be used to defeat the enemy. A business example of such call to action could be offering a free piece of content like an ebook to people who leave your their contact details. Using a message like “Get a free ebook” and the promise of a free piece of knowledge will help you get more people to fill out a form and become a lead or a newsletter subscriber. You want your call to action front and center. It needs to stand out. If your website visitors can’t spot it, they won’t be able to take any action. 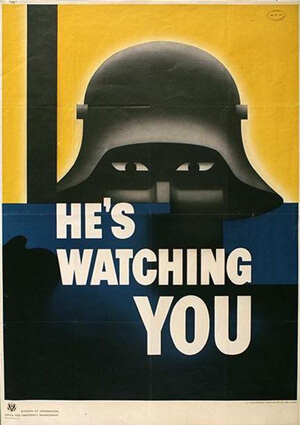 Many WW2 posters used capitalized, contrasting typeface to stand out. They featured colorful graphics that were impossible to miss. Just look at the poster on the right. You simply couldn’t ignore a design like that when passing by. In the same way, you want your call to action buttons big and contrasting with the rest of the website. You can’t afford to make your visitors guess what they need to do to proceed. The placement of your call to action is as important as its look. Even the best design can be ineffective if you are using it in the wrong place. One of the most famous WW2 posters suffered from poor placement. 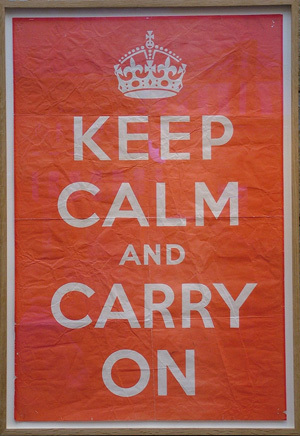 The British Keep Calm and Carry On poster, which has become an Internet sensation over the last few years, went nearly unused during the Second World War! Millions of copies were produced but most of them was never posted. The few posters that ended up being used were often poorly placed, leading to a campaign flop. Make sure that your calls to action don’t get buried under a prominent graphic or don’t blend into the rest of your website. The placement of WW2 posters helped to energize various audiences: in factories, workers were encouraged to work harder. In stores, shoppers were asked to conserve resources. In bars, patrons were asked not to gossip about military matters in fear of spies. In the same way, you can offer different calls to action to different visitors on your website. Using dynamic calls to action, you can automatically change the suggested action depending on the person looking. Whenever you decide to use a call to action, you need to have the next step ready. 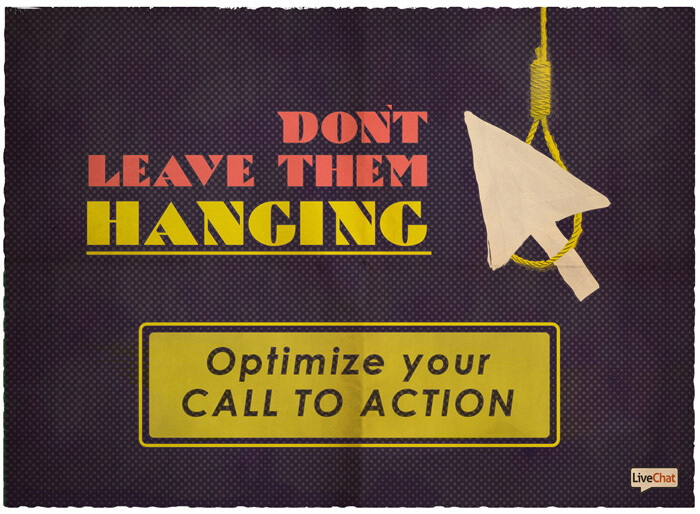 You want to lead visitors who clicked one of your calls to action to a dedicated landing page. Depending on the action you want the visitor to take, this can be a sign up form, payment page etc. 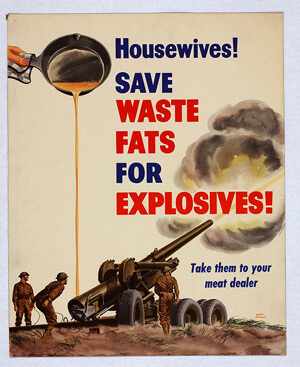 Many WW2 posters stated where certain actions can be taken. For example, people were asked to bring scrap to certain shops or, as in the case of the poster on the right, save waste fat from cooking and bring it to the butcher. What have YOU done for the success of your calls to action? Don’t leave it all up to chance. Use actionable language. You want to energize your audience, not put them to sleep (use strong verbs). Create a sense of urgency. If something can be lost, visitors will want to use it as soon as possible (loosing out on a deal). Promise a reward. Even the most painful or mundane actions can be sweetened with a bit of incentive (like an ebook or a special deal). Prepare a hard to miss design. It’s hard to ignore something if you can’t turn your eyes away from it (because of big, colorful design). Remember to place it correctly. Even the best design for a call to action won’t do you any good when it’s hidden (placed to deep on your page). Have the next step ready. If you want somebody to perform a specific action, make sure you have everything that follows covered (landing page, sign-up form). Something’s missing from the list? Make sure to let me know! 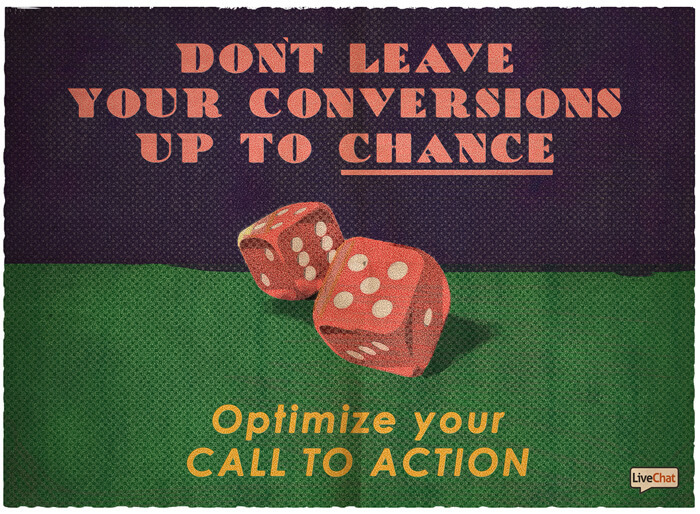 If you have any other call to action optimization methods you use on your website, please share. Want to see what other ways you can use to increase conversion? See how by offering more options in our user onboarding we improved the conversion rate 3x times. Talk to me like shoppers do!